The Camp David accords, which so many Jews hoped would bring the peace so long awaited, are in reality the exact opposite. They constitute a grave danger to the security of Eretz Yisroel, and on the grounds of pikuach nefesh Halachah forbids the surrender of any territory necessary for security. The signing of the Camp David accords by Eretz Yisroel is the most senseless folly imaginable. We have ceded our security  lands, oil, settlements and airfields  for nothing but a piece of paper that can be torn up at any time. The "peace" we thought to gain is a bitter illusion, and the only result is that now we are infinitely weaker and the enemy infinitely more powerful. 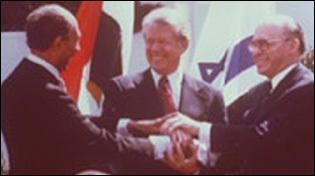 The humiliating concessions made by Eretz Yisroel under the Camp David accords are a direct result of Jewish weakness. Instead of basing our claim to the land on G-ds promise to His people, we prefer to rely on the goodwill and generosity of the non-Jew. Instead of being proud and firm in our identity, we adopt non-Jewish attitudes and quail and cower before the gentile nations. The body of the Jewish people  an indivisible and sanctified unity  has suffered a grievous blow: one limb has cut off another. Every responsible remaining limb is now left to do its lonely grief work, to ponder the pent-up currents of mutual intolerance that ultimately erupted with the tragic assassination of Prime Minister Yitzchak Rabin. At the same time, while lamenting and deploring this divisive and unsanctified deed, no thinking man will want to lose sight of the basic issue that underlies the current ideological contest: whether or not territory should be surrendered in exchange for promises of peace. For at the present critical moment in its history, the Land of Israel  an indivisible and sanctified unity  is tottering under a series of grievous blows, and vital limbs are being irreversibly cut off. In literally hundreds of public addresses delivered since the Six Day War in 1967, the Lubavitcher Rebbe, Rabbi Menachem M. Schneerson, explained why none of the liberated territories of the Land of Israel should be surrendered. Time and again he warned of the grave danger that the Camp David accords pose to its security. With the beginning of Operation Peace for the Galilee in 1982, the Rebbe called for the campaign to be carried through to its logical conclusion  the complete elimination of the terrorist threat to Jewish lives. And soon after, when an Israeli commission of inquiry was instituted to investigate the killings in the Lebanese refuge camps, the Rebbe pointed out that since its sole purpose was to determine Jewish guilt in the matter, instead of determining who were the perpetrators and who issued the orders, this was a travesty of justice. The following synopses of some of the Rebbes addresses on the above subjects were published at their respective times by the undersigned publisher, who trusts that they have done justice to their author. We have chosen to reprint them now, because at a time when some individuals on all sides are being distracted by mutual and collective accusations that are unprofitable, unloving and unjust, the voice of the Torah perspective should be clearly heard.